No. 12 Baylor beats Southern U.
Baylor Bears forward Cory Jefferson (34) celebrates with guard Kenny Chery (1) and B forward Royce O'Neale (00) and center Isaiah Austin (far right) after scoring during the first half against the Southern University Jaguars at The Ferrell Center. What Scott Drew really wanted from No. 12 Baylor in the Bears’ last game before the Christmas break was a sharper performance than last time out. The coach got it, with an 81-56 victory Sunday over Southern University for the Bears’ 10th straight win at home — and 15th victory in 16 games overall. Baylor (10-1) beat another Louisiana team at home four days earlier, but needed overtime to get past Northwestern State. "We weren’t as sharp and crisp the last game we played, but found a way to win," Drew said. "Today, we wanted to be much better. I felt we executed a lot better. Defensively, that’s what we are and who we’ve been. … We were able to build on the lead rather than give it back in the second half." Isaiah Austin had 14 points and 10 rebounds, the first double-double this season for the 7-foot-1 center while leading five players scoring in double figures. Tre Lynch had 27 points, including five 3-pointers, to lead Southern (3-9), which shot 34 percent from the field (18 of 53) and was outrebounded 39-27. The Jaguars, who made it to the NCAA tournament last season as the Southwestern Athletic Conference tournament champions, are 0-4 against Top 25 teams this season. They were coming off a 69-43 loss at top-ranked Arizona on Thursday night, which had been the most points Southern allowed to the ranked teams. Southern coach Roman Banks said Baylor stacks up with the other ranked teams his team has played. The Jaguars opened the season with a loss at then-No. 17 Marquette and also lost at No. 16 Florida. "They are probably just as good as some of the Top 20 teams that we’ve played. I think any given night, they can step on the floor and win," Banks said. "Those three bigs that they rotate keep the pressure on you. If you can’t match that length and intensity, it’s pretty hard on you, which gave us a lot of problems." Brady Heslip had 13 points for Baylor, while big men Cory Jefferson and Rico Gathers both had 12. Kenny Chery had 10 points. Asked about the Bears’ balanced scoring, Austin said it’s great. "Nobody on this team is selfish at all. Sometimes I’ll have four points, Cory will have 30, Kenny will have 20 some games, and some games Brady won’t get up a shot, but nobody complains," Austin said. "We’re all in it for the long run. We want to win games, and we’re a great brotherhood right now." Jefferson had 11 points on 5-of-6 shooting by halftime, when Baylor led 36-26. Baylor had a 32-16 lead after an 8-0 run when jumpers by Jefferson 5 minutes apart provided bookends for the spurt, with four free throws in between. At the same time, Southern went 6:48 between baskets — and points. Lynch’s 3-pointer with 3 minutes left in the first half finally ended the drought by the Jaguars, who then had a 10-1 run to get within 33-26. But they never got closer after Cameron Monroe’s layup with 1:18 left. The Bears had the 10-point halftime lead and that gap was only cut to seven even as they went more than 5 minutes before making a field goal. Royce O’Neal had a layup for Baylor’s first basket after halftime, making it 43-30 with 14:39 left. Austin added a jumper 42 seconds later. 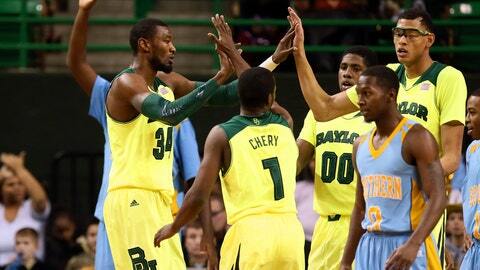 Baylor, the defending NIT champion whose lone loss the past 16 games was to No. 2 Syracuse last month in Hawaii, won’t play again until Dec. 30 against Oral Roberts. That is one of two non-conference games left for the Bears before opening Big 12 play Jan. 7 at Iowa State. YonDarius Johnson and Calvin Godfrey entered the game as Southern’s top scorers, averaging 12.6 and 12.4 points per game, respectively. Johnson scored two points in his 19 minutes while Godfrey was scoreless, going 0 for 4 in 20 minutes while dealing with foul trouble throughout the game. "We wanted to make (Lynch) work to score. He had a good game, but we stopped the other guys," Chery said. "Probably their best player, which was Calvin Godfrey, we did a great job on him. We have to credit our big men for that, and that was pretty much it."